If we tend to think society today is more violent than at any time in our history, all we have to do is follow Professor Pinker’s conclusions to conclude that, as he insists, we are clearly wrong. The author goes to great lengths in over 10 chapters in his bid to prove this. “The decline of violent behavior has been paralleled by a decline in the attitudes that tolerate or glorify violence.” This is an early salvo from Steven Pinker’s The Better Angels of Our Nature: Why Violence Has Declined. Mr. Pinker’s basic premise is that we don’t really watch football on Sunday, boxing on Saturday, and MMA (Mixed Martial Arts) death matches on Friday night because we tolerate or glorify violence; we watch for the competitiveness. We don’t fight wars, declared or otherwise; we save those unable to save themselves. Well, perhaps that is too much of an oversimplification, but you get the gist: We tend to provide facts and figures that either only support our position or that only show us in the best possible light. In every generation there are those who look back somewhat romantically “to the good old days; to simpler times.” Were those times any better (less violent) than today? The author seems to think so and makes a detailed argument supporting said point in this 832-page volume. One cannot help but compare this book to Dangerous Times: The International Politics of Great Power Peace by Christopher J. Fettweis, reviewed in NYJB in December 2010. Both authors take great pains to build detailed and heavily researched explanations for their parallel positions. Both are academics and write for a well-educated audience. And yet they take two very different paths. 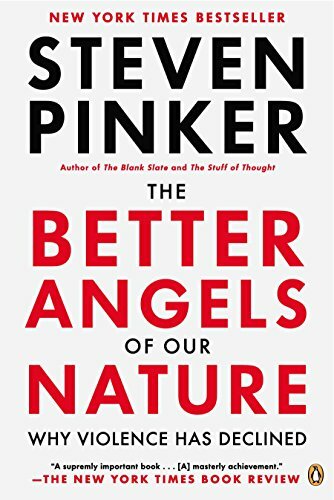 Dangerous Times appeared intended for an audience that falls into a specific and small niche, academically or politically oriented, while Better Angels gives the impression that Professor Pinker expected to accomplish broader audience appeal. Unfortunately only those truly intrigued by Mr. Pinker’s premise—or already established fans of his writing—will be able to get through the entire book. This is not to say the author writes in an unappealing manner, quite to the contrary: His style is fluid while at the same time generously peppered with resource material, statistical information, and very explicit examples—the latter sometimes to the book’s undoing. The Better Angels of Our Nature: Why Violence Has Declined is laid out in a curiously overlapping way, including six trends, five inner demons, four better angels, and five historic forces. Most of the author’s references to, and justification for, his conclusions on the earliest transitions are based on the Bible (Old Testament first, then New Testament). Yet he does make it clear he is (we are) not necessarily able to take the references literally. This creates a question as to the validity of the early assumptions—and this approach is repeated for several of the succeeding periods. Late in the book the reader is left with a conundrum: Should a governmental policy of omission (not solving a food crisis) be counted as violence (or not) when a policy of commission (human rights abuses) is? Beginning in Chapter Eight, Hydraulic Theory of Violence, Professor Pinker breaks down the five “inner demons” as proof we have evolved, psychologically, away from innate violence. We further mature in Chapter Nine with our “better angels” of 1) empathy; 2) self-control; 3) moral sense and 4) reason to rationalize our individual empowerment to handle life in a less violent way. The author wraps up his hypothesis citing his five historical forces—going to great lengths to identify the exogenous factors that favor peace. One nagging concern is the author’s insistence throughout the book that physical violence is the only violence that counts as proof of how today is so much better than the past. It appears that Professor Pinker chooses to ignore psychological or political violence. Isn’t it true that those who die today from the indirect effects of governmental decisions, actions, or lack thereof are nonetheless still victims of violence? For someone who teaches psychology, as the author does, this seems a curious and selective position.